29-year-old Londoner Nicky Ashwell, who was born without a right hand, has been fitted with one of the world's most advanced robotic prosthetics. 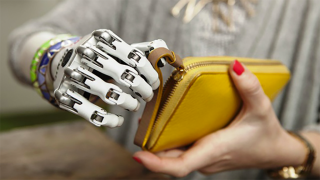 The 'BeBionic small' has 337 mechanical parts and is slimmer than most prosthetics. Its creator, a firm from Leeds called Steeper Group, says it was made specifically with women, teenagers and smaller-framed men in mind. It was designed using Formula One technology, and built around an accurate skeletal structure using miniaturised components. Each finger has separate motors that can move independently, controlled by muscles in the arm, and the joints are hinged on rare-earth magnets. To further enhance the realism, the fingertips contain air bubbles. It's also pretty sturdy, able to cope with 45kg of force - the same as 25 bricks. It's capable of 14 different grip patterns and hand positions, allowing Ashwell to lift small objects, hold onto the pole on a train or even ride a bike. "I keep finding myself being surprised by the little things, like being able to carry my purse while holding my boyfriend's hand," she said, adding that while it comes with a cover she doesn't like using it. "I quite like it like this. I'm not trying to disguise it as a real hand. I'm happy for it to look all robotic and cool."